It will also be clearer when Twitter has cracked down on offenders. Twitter's attempt at automatically fighting abuse hasn't worked flawlessly. However, you might not mind the missteps quite so much now that it's implementing some (arguably overdue) improvements to both mute controls and abuse report feedback in its mobile apps. 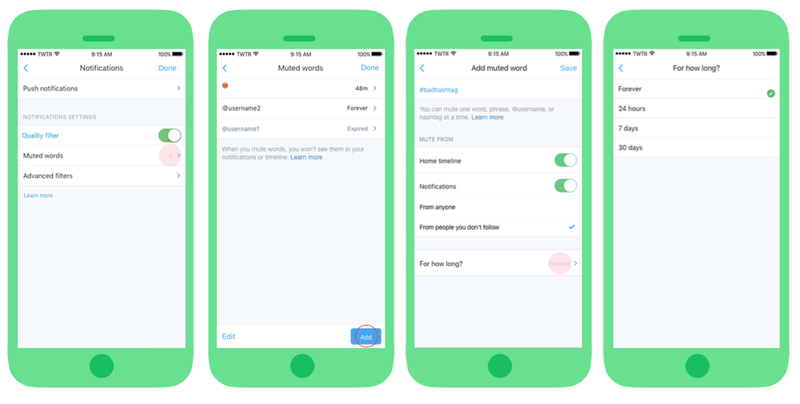 You can now mute people based on account types, including those with unverified email addresses, unverified phone numbers and even default avatars -- finally, there's an official way to mute those notorious egg accounts trolls like to use. Twitter is also building on its previous mute upgrades by giving you options to mute both directly from your main timeline and to specify how long a mute lasts, whether it's permanent or just for a short while. This time-based muting isn't completely new (Tweetbot says hi), but it'll still be helpful if you want to avoid a nasty discussion for a day. The social network is doing more to follow up when someone has crossed the line, too. When you report someone, you'll get in-app notifications when Twitter receives a report and takes action against an offender. You won't have to check your email to see if the company has suspended that troll you reported the other day. The changes should be available worldwide in the "coming days and weeks." The mute controls aren't Twitter's strongest weapon against abuse, since they don't actually stop trolls by themselves -- you just don't see their vitriol in your mentions. However, it might discourage harassment by making it clear that the targets won't have to put up with that hate, even from dedicated harassers who create new accounts as quickly as the old ones are knocked down. If nothing else, it shows that Twitter was telling the truth when it said it would pick up the pace on anti-abuse features.